Alexis oversees the firm’s marketing and business development initiatives and works with the attorneys to implement key programs in accordance with the firm’s business goals and growth plan. She collaborates with the firm’s attorneys, management, and staff to identify and develop opportunities for growth and implement strategic plans to support the firm’s business development efforts. She works with the attorneys to develop new client relationships and manage existing client relationships. Her day-to-day duties are wide-ranging and include researching business development initiatives for attorneys, handling the firm’s RFP/RFQ submissions, designing sponsorship materials, planning client events, and overseeing the firm’s website and public relations activities. She also enjoys overseeing Conrad O’Brien’s Women’s Initiative Committee and working with the co-chairs to plan events and initiatives for both women at the firm and their colleagues. 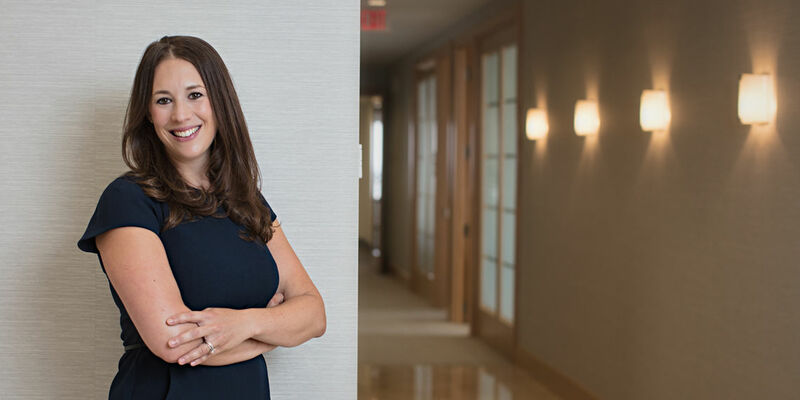 Prior to her current role spearheading Conrad O’Brien’s marketing and business development efforts, Alexis was a litigation associate at Conrad O’Brien as well as at a another Philadelphia-based law firm where she focused on casualty litigation. Alexis lives in Philadelphia with her husband and baby boy and is enjoying exploring the city from her son’s perspective after living here for many years and growing up in the area. She enjoys traveling, skiing, and keeping up with the Philadelphia restaurant scene. She is also a long-distance runner and has completed two marathons and several half marathons and distance runs. Alexis remains involved with her high school alma mater, The Baldwin School in Bryn Mawr, Pennsylvania.
" How to Spearhead Key Marketing Initiatives and Provide Proactive Marketing Support – Regardless of Your Firm’s Size and Bottom Line Budget," LMA Northeast Conference; Boston, MA; October 2018. "Think Like an Attorney: A Day in the Life," LMA Future Leaders Boot Camp; Philadelphia, PA; May 2018.